Folded roof house is CKR second house for Swedish kit house manufacturer Arkitekthus. A one-story house with an asymmetric folded roof plan. The bedrooms are positioned at the gable ends and the living room and kitchen is between, with an open main facade. 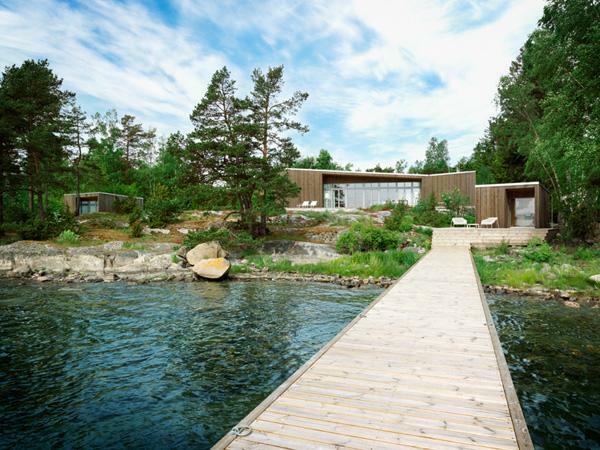 For the site on Musko island the separate guest house and sauna building were specifically designed for the the client. Conceived for the harsh, climatic extremes the modular house-transformer can respond dynamically to its environment by mechanical adaptation to meteorological and seasonal conditions. The flexibility of the D*Haus allows adaptation from day to night and winter to summer by literally moving inside itself. The thick heavy external walls unfold into internal walls allowing glass internal walls to become facades. Doors become windows and vice versa. In the winter time, the house-transformer is in a square formation, with small surface area and small windows. It literally hugs itself. As the climate warms and seasons change, the house opens up, like a flower opens up to allow light and air to penetrate the inside of the building offering full panoramic views of the surroundings.